D. Sarah Stamps, a first-year graduate student at Purdue University, is the lead-author on a paper presenting "A kinematic model for the East African Rift" published recently in 'Geophysical Research Letters' (Stamps et al., 2008) and highlighted by the American Geophysical Union. It is based on a kinematic model she developed as an undergraduate student at the University of Memphis, Center for Earthquake Research and Information, with Eric Calais of Purdue University and five other collaborators from institutions in Tanzania, France, Portugal, and the US. Sarah has participated in several UNAVCO-supported GPS survey campaigns in East Africa since 2006, and the new data from these campaigns will be used to refine the kinematic model of the East African Rift. Although the East African Rift (EAR) is often cited as a modern archetype for rifting and continental breakup, it remains the least understood of all major plate boundaries. In particular, the rate of plate divergence across it, how this divergence is accommodated within the rift, and how the rift connects farther south with the Southwest Indian Ridge (SWIR) remain to be determined. Information needed to solve this problem is sparse, but Stamps et al. found that geological data covering the past 3.2 million years along the SWIR are consistent with current geodetic data in East Africa. They then inverted the two data sets jointly to obtain the first complete kinematic model for the EAR. 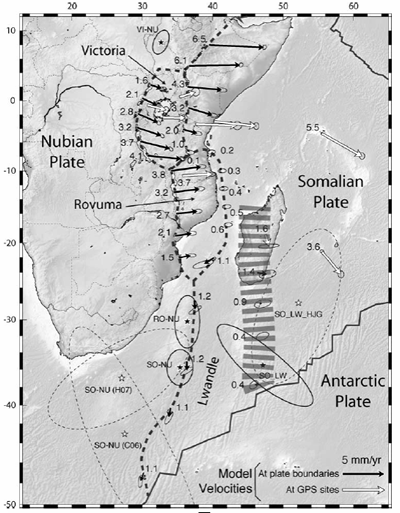 They show that the data are consistent with the existence of three subplates embedded within the rift, Victoria, Rovuma and Lwandle, as previously suggested from earthquakes but left unquantified, illustrating the initial process by which a continent breaks apart. Stamps, D.S., E.Calais, E.Saria, C.Hartnady, J.-M. Nocquet, C.J.Ebinger, and R.Fernandes (2008), A kinematic model for the East African Rift, Geophys. Res. Lett., 35, L05304, doi:10.1029/2007GL032781. 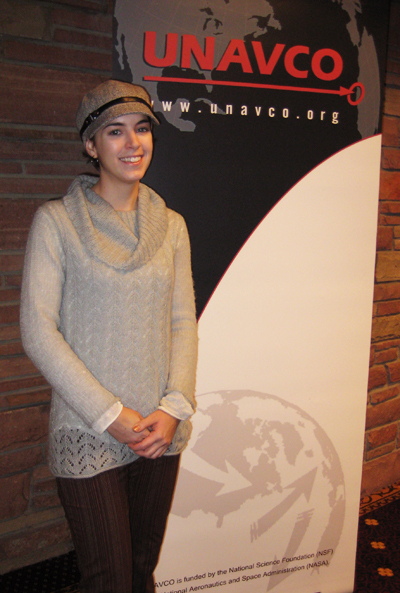 Figure 1 - D. Sarah Stamps recently participated in the UNAVCO Science Workshop (March 11-13, 2008) in Boulder, CO, where she presented a poster on her research in East Africa. Figure 2 - Best-fit kinematic model of the East African Rift. Relative motions along plate or block boundaries are shown with black arrows, and numbers are model velocities in mm.yr_1. Relative rotation poles are shown with black stars. The first plate rotates counter-clockwise with respect to the second, except for VI-NU where Victoria rotates clockwise with respect to Nubia.